The 6th annual Bathroom Blogfest, taking place from Oct. 24 to 28, brings more than 33 bloggers and 34 blogs from various industries together to write about this year’s theme, “Climbing Out.” It focuses on improving the overall bathroom experience for end-users by bringing attention to the various aspects of a bathroom, including the floors, fixtures, design, and the retail experience. See the list of participating bloggers at the end of this post. Bathroom Blogfest couldn’t have come at a better time this year. When I read the theme, “Climbing Out,” it was like an omen. The stars and planets aligned and I got the go ahead to literally climb out my apartment of the last two years and move somewhere where I can stretch my legs. On a couch because the new place has room for one of those. I kind of live like this. Almost as exciting as the possibility of a couch is finding an apartment with a bathroom that fits the standards of an industrialized nation; full sized bathtub, a floor with all the tiles that should be there and a window that closes and opens without exerting enough effort to pop a coronary. This is the street that wraps around my building and wraps around to my front door. It’s not that I’m living in filfth and poverty. I’m actually in what is considered a very nice neighborhood but the building is well over 100 years old. It was an old hotel that was converted to apartments in the early 1980s and not much has probably been updated since. 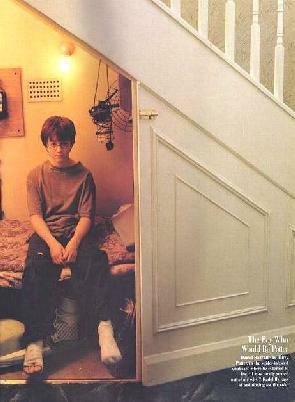 My bathroom is pretty close to Harry’s cupboard. As if size weren’t enough, have a look at the lovely tile under my feet. If my floor was a tetris game it would actually be pretty good. This mystery spill has perplexed me for the last two years: I’m guessing it is some kind of urethane? Bleach, razor blades and yelling did nothing to lift the spot. Kind of ironic that it’s yellow in the bathroom though. I will happily bid adieu to the most disgusting tiled shower I’ve ever lived with. And I can only share this because I’ve—literally—scrubbed these grout joints with a toothbrush or three. Good bye to all my little organism friends living in there. Good bye to the cracked tile that leaks through the wall into the hallway. I will never again have to talk to the crotchety old neighbor about the perils of water damage and mold. This is very similar to my 8th grade mosaics project. Remember the window that I mentioned earlier on? It really doesn’t close unless it is meant to be permanent. Yes, I am climbing out of this outdated bathroom in desperate need of real maintenance. And by real maintenance I mean someone who can install a light fixture properly. (Not me of course). Is the white stuff that lands on my sink baby powder or gypsum? It goes without saying that I am ecstatic about moving. The new bathroom may be pink but I learned to live with brown over the years. I’m sure pink will soon become my new signature color. Next post: Marazzi on "I Hate My Bath"